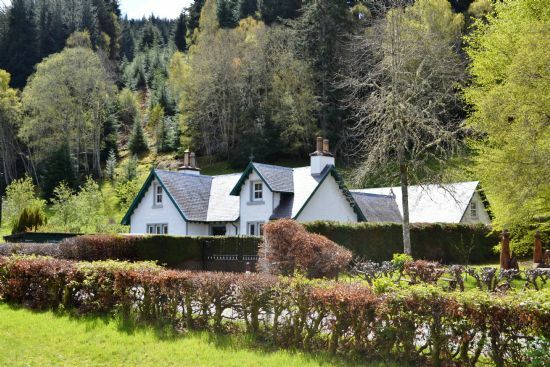 Forester’s Lodge is a large private, family-friendly, self catering country house in the Highlands, situated in a bright spot next to Farigaig Forest and a few minutes stroll to the banks of Loch Ness. Sleeping a maximum of 8 adults, and up to ten if including under 16s, plus cot space for a baby, this holiday home enjoys two wings and linked by the large kitchen and dining area. This is ideal for an extended family, or two families holidaying together, or a few couples looking for the perfect break where they also have a bit of space to enjoy their own privacy. There is also five bathrooms in the property! Only 16 miles from Inverness in the Scottish Highlands and half way down the less commercial south side of the Loch it offers a luxury home from home experience. The village of Foyers is within easy reach. There are several local woodland walks around the house, with wildlife including deer, red squirrels and pine martens. Forester's Lodge combines easy access to the facilities in the city with the escape of country living. Forester’s Lodge also makes a great holiday base for the Island of Skye, Glen Coe, Aviemore , the Cairngorms National Park and directly across Loch Ness is Urqhart Castle. Castle Stuart Golf links and Culloden Battlefied is around 25 minutes away. Forester's Lodge has everything you could want from a Scottish Highland hideaway – log fires, a four oven stove keeping you cosy in the winter months, an entertainment lounge for kids of all ages and a number of en-suite bedrooms. See 'At Forester's Lodge' for more details.